Ever pull a hail Mary, 5 minutes before you need to start cooking, and just punch a couple of random ingredients into Google, hoping someone, somewhere has learned how to make them into a tasty dish? I do... probably more often than I should admit. 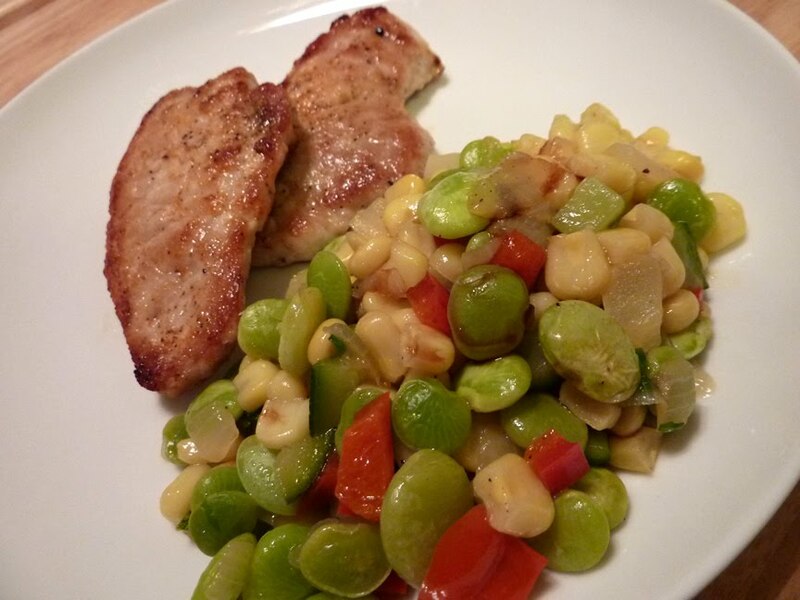 Last night, it was because I had pork chops and a bag of frozen lima beans and it just didn't feel interesting enough so I tried to think of what I had on hand to spice that up. The only thing that came to mind was the new bottle of beautiful balsamic vineger I bought at Vom Fass over the weekend. Balsamico and lima beans didn't sound like a likely match to me but just in case, I googled them together and what I found was a recipe for Balsamic Succotash that I had all the ingredients for and just enough suspension of skepticism to try. Good thing, because it was really nice! Melt butter in a large nonstick skillet over medium heat. Add onion and garlic and cook 3 minutes or until onion softens, stirring occasionally. Add zucchini and sauté for one minute. Add corn, bell pepper and beans; cook 4 minutes, stirring occasionally. Add fresh basil, broth, sugar, salt, and black pepper; cook 7 minutes or until liquid almost evaporates. Remove from heat and top with balsamic vinegar, stirring gently. Speaking of balsamic vinegar, last week was my first time finally getting to Vom Fass, the shop at Magazine and Nashville that specializes in a wide selection of oils, vinegars, wines and spirits. They have whole walls of casks dedicated to each and you can taste anything you like. Kid Cayenne and I tasted at least 3 or 4 Aceto Balsamico di Modenas before deciding on a small bottle of thick, delicious "Maletti". What's wonderful about this is that you can get whatever amount you like, from 40ml to several hundred, allowing you to try special things without wrecking your grocery budget on a large bottle. Perfect for us. We also tasted and purchased some lovely olive oil. Nick, the General Manager, was infinitely patient and informative as I searched for an olive oil that had just the right balance of flavor for my taste. Vom Fass has a modest selection of wines and a much wider selection of spirits and liqueurs. I noticed grappas, absinthe, brandies and whiskeys (a few of which we also tasted). On a shady corner with not much signage, Vom Fass might be going un-noticed by many. It's worth a visit (or several) and could certainly use the word of mouth. Go!